The daily band lineups have been revealed for the 11th annual Rock On The Range, America’s premier rock festival, May 19, 20 and 21 at MAPFRE Stadium in Columbus, OH. Tickets for Rock On The Range sold out in record time, just over one month after going on sale, marking the fifth consecutive advance sellout for the festival. 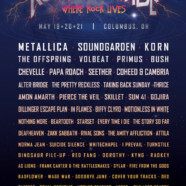 Rock legends Metallica, Soundgarden and Korn will each headline one night of America’s largest and most-acclaimed rock festival, while the ROTR Rolling Rock Comedy Tent will feature sets from nationally known comedians plus Columbus’s top comedy talent. For more information, visit www.RockOnTheRange.com. Rock On The Range celebrated its 10th year in 2016 – and after a decade of setting the standard for American rock festivals, the crown jewel of the World’s Loudest Month showed no signs of slowing down, with 120,000 “Rangers” from around the globe descending on MAPFRE Stadium. Last year, the festival received awards of recognition from both Columbus Mayor Andrew J. Ginther and the City Council, as well as a resolution from the Franklin County Board of Commissioners acknowledging more than $140 million in economic impact that the festival has contributed to the city over its 10-year existence. Rock On The Range is produced by Danny Wimmer Presents, AEG Live, and MAPFRE Stadium. Rock On The Range is supported by our rockin’ sponsors: Monster Energy, Bud Light, Jack Daniel’s and Zippo. These partners, along with many others, will feature interactive experiences, artist meet & greets, and other unique fan engagement opportunities throughout the festival.